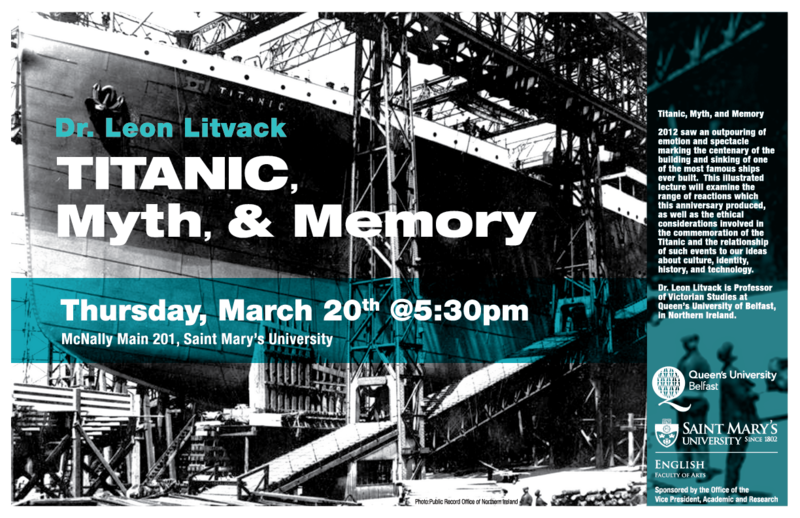 I’m glad to confirm that Dr. Leon Litvack, of Queen’s University, Belfast, will be coming to Saint Mary’s on Thursday 20 March 2014 to give a talk entitled, “Titanic, Myth, and Memory.” The talk will take place at 5:30pm in MM 201. All are welcome to attend. Dr. Leon Litvack is Reader in Victorian Studies at Queen’s University Belfast. He is a renowned Dickens scholar and broadcaster, working primarily on the novelist’s letters, manuscripts, and photographs. He is currently producing the authoritative critical edition of Dickens’s last completed novel, Our Mutual Friend. He has also worked extensively in the field of Irish Studies, especially on the construction of Irishness in nineteenth-century culture. He is the child of Holocaust survivors, and has written and spoken extensively about the Jewish wartime experience.